A 63-year-old male was evaluated on an urgent basis for pain, redness, and "elevated eye pressure" in the left eye (OS). He described a history of three similar episodes OS, in which he had the same symptoms and his eye pressure was elevated. His first episode occurred approximately 20 years ago (1980s), and at that time, he was diagnosed with acute angle-closure glaucoma (AACG) and treated with a large surgical iridectomy by an outside provider. Review of previous intraocular pressure (IOP) measurements showed an IOP spike to 54 mmHg in 2004 and 54 mmHg again in 2014. IOP ranged from 11 to 15 OS in between the episodes of high IOP. He has not required IOP-lowering medications in between episodes. He denied any history of cold sores, shingles, or other rash. The episodes of pain and high pressure have not been preceded by or accompanied by systemic symptoms or illness. 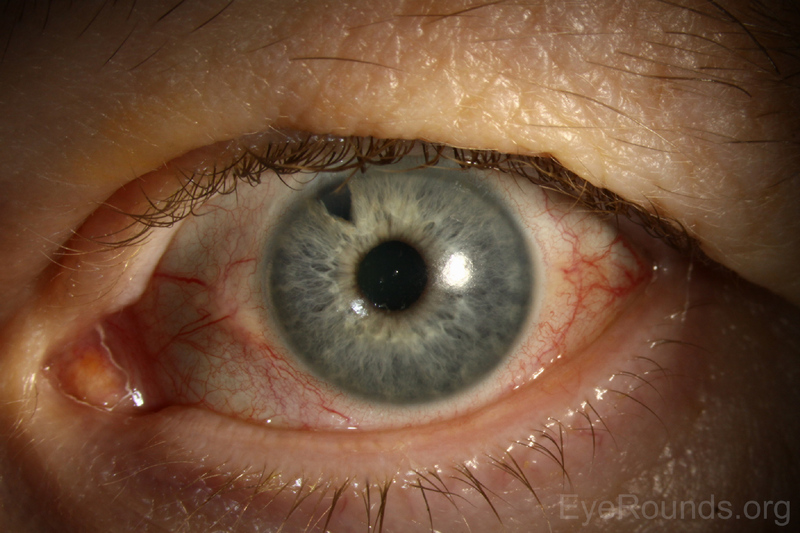 Figure 1: Slit lamp photograph of the left eye shows mild conjunctival injection. The pupil is irregular with posterior synechiae at 11 o'clock. The cornea is clear. The surgical PI is visible at 11 o'clock. 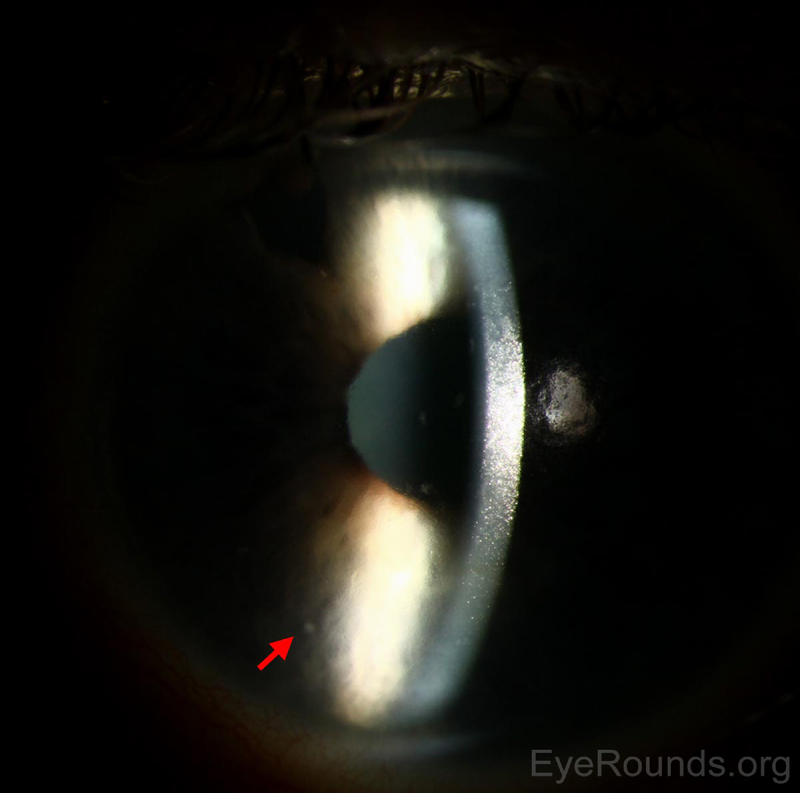 Figure 2: Slit lamp photograph of the left eye reveals a faint, small KP visible on the corneal endothelium (arrow). The patient presented with a history of multiple episodes of elevated IOP OS over a period of several decades. IOP returned to normal without medications between spikes (Figure 3). A local provider initially treated our patient for AACG with surgical PI. Given his deep/wide angles on gonioscopy OU, this acute elevation of IOP in the 1980s was likely misdiagnosed as AACG. Outside records surrounding this episode could not be obtained. Our records, which captured two of the past three episodes, indicate that the IOP spiked to the mid-50s with only mild concurrent inflammation. With the episode detailed above, there was again evidence of subtle inflammation, including mild conjunctival injection, faint KP, and trace anterior chamber inflammation. Figure 3: IOP for the patient over several decades with episodes of elevated IOP in 2004, 2014, and 2016. This graph is modeled after a graph by Posner and Schlossman (1948) . There was no evidence that his high IOP and inflammation were due to herpes simplex virus (HSV) (i.e., no history of skin lesions, corneal dendrites, transillumination defects, ciliary flush, or decreased corneal sensation). He had previously tested negative for other causes of infectious/inflammatory uveitis, including syphilis, sarcoidosis, HLA-B27, tuberculosis, and Lyme disease. The presence of small peripheral anterior synechiae (PAS) was suggestive of prior inflammation. However, despite his history of recurrent episodes, he had very little sequelae of chronic inflammation. Although Fuchs' heterochromic iridocyclitis (FHI) is on the differential for recurrent unilateral inflammatory glaucoma, there was no iris heterochromia, iris transillumination defects, stellate KP, or fine angle neovascularization to suggest this diagnosis. Humphrey 24-2 visual field testing from a routine follow-up visit five months prior indicated that the patient had a full visual field in both eyes. Cup-to-disc ratio was slightly larger on the left, and optical coherence tomography (OCT) of the retinal nerve fiber layer (RNFL) confirmed mild RNFL thinning and ganglion cell loss in the left eye only. On review of prior IOP records, the pressure in the left eye appeared to range in the low teens to 20 in between episodes. For acute management of the patient's elevated IOP, he received three rounds of brimonidine tartrate and timolol-dorzolamide (Cosopt®) every 15 minutes in addition to one dose of 500 mg oral acetazolamide. IOP decreased to 24 mmHg after several hours. Due to the subtle anterior segment inflammation, prednisolone acetate 1% was also started. The patient was instructed to continue timolol-dorzolamide (Cosopt®) twice daily (BID), brimonidine tartrate BID, and prednisolone four times daily OS. One week later, IOP OS had decreased to 12 mmHg. His prednisolone acetate 1% was tapered, and his IOP lowering medications were gradually stopped. Posner-Schlossman syndrome (PSS), also called glaucomatocyclitic crisis, is a rare inflammatory glaucoma that was first described in 1948 and affects individuals ages 20 to 60 . PSS classically presents as recurrent episodes of unilateral, transient elevations in IOP, ranging in the 40s to 50s mmHg. The IOP elevation is typically out of proportion to the degree of pain and anterior chamber inflammation. IOP as high as 70 mmHg has been reported . Vision loss occurs due to glaucomatous damage, which is thought to accumulate during episodes of markedly raised IOP. Clinically, scant KP are seen; these may be referred to as "sentinel KPs." In our patient, the anterior chamber inflammation was minimal, and only a small cluster of KP was detected. Generally, peripheral anterior synechiae (PAS), and other severe sequelae of chronic uveitis, are not seen in PSS, unlike in other inflammatory glaucomas. Our patient was noted to have only a small area of PAS. Mild corneal edema due to elevated IOP may also be present on exam, as was noted with our patient. Some evidence suggests that PSS may be associated with certain human leukocyte antigen (HLA) genes . Several observational studies have investigated the association between PSS and active cytomegalovirus (CMV) infection in the anterior chamber [4-6]. Some uveitis specialists advocate treatment with valganciclovir both during attacks and between attacks as a prophylactic measure. However, a clear causal relationship between CMV infection and attacks of PSS has not been established. Other infectious associations have been proposed, including herpes simplex virus (HSV) , varicella zoster virus (VZV) , and Helicobacter pylori . Unlike other inflammatory forms of glaucoma, the etiology of increased IOP in PSS cannot be explained completely by trabeculitis and/or inflammatory debris causing obstruction of the trabecular meshwork, as there is minimal anterior segment inflammation. Other explanations that have been postulated include alterations in vascular regulation or autonomic physiology [10-11]. Attacks may last up to several weeks, but they can also resolve within one day when properly treated. Acute attacks of PSS are managed with IOP-lowering agents (topical +/- oral) as well as anti-inflammatory drops, such as prednisolone. Between episodes of PSS, the IOP is usually within a normal range. This characteristic helps distinguish PSS from other forms of inflammatory glaucoma that include subacute or chronically elevated IOP. The exception to this rule is that some patients with PSS may also have underlying primary open-angle glaucoma . Current research has not clearly established whether treatment with IOP-lowering medications reduces the frequency of future glaucomatocyclitic attacks. In one retrospective case series of 50 patients diagnosed with PSS, the development of glaucomatous visual field changes and optic neuropathy was proportional to the duration of disease . Therefore, patients with PSS should be followed, at minimum, on an annual basis even if their attacks occur on a less frequent basis. For more photographs and videos, please visit the chapter from the Iowa Glaucoma Curriculum on glaucomatocyclitic crisis. Posner A, Schlossman A. Syndrome of unilateral recurrent attacks of glaucoma with cyclitic symptoms. Arch Ophthalmol 1948; 39:517-520. Jap A, Sivakumar M, Chee SP. Is Posner Schlossman syndrome benign? Ophthalmol 2001; 108(5):913-918. Hirose S, Ohno S, Matsuda H. HLA-Bw54 and glaucomatocyclitic crisis. Arch Ophthalmol 1985; 103(12):1837-1839. Chee SP, Bacsal K, Jap A, et al. Clinical features of cytomegalovirus anterior uveitis in immunocompetent patients. Am J Ophthalmol. 2008; 145:834-840. Chee SP, Jap A. Presumed Fuchs heterochromic iridocyclitis and Posner-Schlossman syndrome: comparison of cytomegalovirus-positive and negative eyes. Am J Ophthalmol 2008; 146:883-889. Rodier-Bonifas C, Cornut PL, Billaud G, et al. Cytomegalovirus research using polymerase chain reaction in Posner-Schlossman syndrome. J Fr Ophthalmol 2011; 34:24-29. Yamamoto S, Pavan-Langston D, Tada R, et al. Possible role of herpes simplex virus in the origin of Posner-Schlossman syndrome. Am J Ophthalmol 1995; 119:796-798. Tanaka Y, Harino S, Hara J. Cellular immunity as judged by varicella skin test in Posner-Schlossman syndrome in patients. Folia Jpn 1985; 36:972-976. Choi CY, Kim MS, Kim JM, et al. Association between Helicobacter pylori infection and Posner-Schlossman syndrome. Eye (Lond) 2010; 24(1):64-69. Raitta C, Vannas A. Glaucomatocyclitic Crisis. Arch Ophthalmol 1977; 95(4):608-612. Puri P Verma D. Bilateral glaucomatocyclitic crisis in a patient with Holmes Adie syndrome. J Postgrad Med 1998; 44(3):76-77. Kass MA, Becker B, Kolker AE. Glaucomatocyclitic crisis and primary open-angle glaucoma. Am J Ophthalmol 1973; 75(4):668-673.